Your event was a success: Now what? Would you invite someone out on a date, wine and dine the person, drop him or her off afterwards and then never call again? Probably not, unless the two of you really didn’t hit it off. So why do many companies pour time, money and manpower into mounting an event, only to ignore attendees after it’s all over? It’s easy to let follow-up slide after an event. You’re exhausted from the effort of running the event, and when you return to the office, there’s a backlog of emails and phone calls to respond to. And without a post-show plan, it’s tempting to push activities such as responding to information requests and thanking attendees onto the back burner. But prompt, thoughtful follow-up will help you realize a positive ROI on your live seminar or Webinar, executive briefing, trade show or social function. Informal research among my clients shows that only 17 out of 100 people who attend an event will initiate the next step in the buying process. The other 83 will wait for you to make the next move. Here are four essential questions that can help in post-show planning. A personalized letter or email. You’ve just spent a lot of money to lure this person to your event and get this lead. Don’t send out a mass email that begins, “Dear Seminar Attendee.” Personalize each communication and add your handwritten signature to printed letters. The content of your note should tie into the event’s objectives. If your goal was to deepen relationships with key customers and prospects, you can simply thank them for attending. But if your goal was to educate attendees about a new product or service, recap the salient features and benefits. You might also want to ask for feedback on the event itself and enclose a short evaluation form. If you’re sending collateral material, use your cover letter to flag where pertinent information can be found. For example, say something like “See page 32 for the checklist we discussed.” Research shows that literature accompanied by a cover letter gets read and acted upon more frequently than literature alone. If you’re sending email, add a subject line that has punch and relevance. A phrase such as “information from Jones Corp. per your request” ensures that your message gets opened and read. Relevant collateral material. During the event, offer to send a free, useful tool such as a checklist or newsletter. If a prospect is interested in a particular product or service, send brochures and other supporting material. A reply device. Include a postage-paid reply card or reply form. This makes it easy for attendees to request more information and tell you more about their readiness to buy. Be sure to include a few easy-to-answer questions pertaining to budget, timetable and products that are of interest. 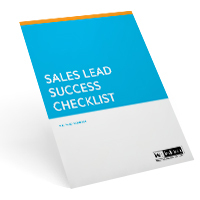 The answers can help you further qualify each lead. If an old-fashioned reply card seems outmoded, consider this: one of my clients mailed to IT professionals on four different occasions and found that nearly 85 percent returned the reply card instead of responding by email, calling a toll-free number or visiting a Website. An advertising specialty. Consider including an item such as a magnetized calendar or a set of highlighters that recipients will keep at their desks. Advertising specialties ensure that your name and contact information will linger long after your note and literature have been filed or tossed away. A business card. Including a business card may make it easy for prospects to find your name and number when they need it. Or attach a vCard to your email. Communicate with everyone who attended-and didn’t attend. If people RSVP’d but didn’t show up, don’t delete their names from your database. The fact that they signed up indicates that they’re interested in your subject, but an emergency meeting or client crisis may have kept them from coming. Offer to send them handouts or an audio recording of the event. If your event was a Web seminar, direct them to a Web address where they can replay the recording of the event. It’s immediate: you can send a message or respond to a request for information instantly. It’s nonintrusive: the recipient will read the email at a time that’s convenient for him or her. It’s less costly than mailing out a printed piece. However, email lacks what I call the “thud factor.” A heavy, glossy brochure that hits the recipient’s desk with a resounding thud carries a prestige and permanence that email doesn’t have. You may want to use a combination of email and snail mail: send an electronic message to show immediate response, but also mail a printed brochure that recipients can show to their bosses or take to a meeting. Phone calls can be an effective follow-up as well, especially for uncovering hot prospects. You can thank each prospect, get their feedback on the event, qualify them further, find out if they need additional information and determine what the next steps should be. Many sellers prefer contact by phone because it enables them to hear nuances in their customers’ voices. Bottom line-choose the means of communication that works best for you and your prospect. In fact, it’s a good idea to have a box on your lead form that indicates which medium prospects prefer. No matter how you choose to follow up, do it immediately. It’s your second chance to make a good first impression. Immediate response requires that you have a plan in place. Don’t wait until after the show to figure out who’s going to take care of fulfillment, qualify leads, distribute them to the sales force and add names to your marketing database. Determine in advance who will complete each task, and make sure you have your collateral materials printed and ready to go. Here’s one final tip: follow up with attendees as you would want them to follow up with you-promptly and professionally. Make a few attempts to reach attendees and engage them in a dialogue, but don’t become a pest. Don’t ignore them either-follow-up is not a one-time gesture. Add each person to your marketing database so they can receive future communications such as newsletters and product announcements. Event follow-up isn’t easy; it requires foresight and planning. But it can also help ensure that customers say yes to a second date-and, ultimately, to a sale. What role should events play in your marketing plan? If you're responsible for B2B marketing, lead generation or sales, this monthly newsletter is for you! Looking for a Demand Generation Agency or Lead Generation Services? Visit our sister company AcquireB2B. Copyright 2001-2018. M.H. McIntosh All rights reserved. © 2019 Mac McIntosh Inc.. All Rights Reserved.